Here you will find links to web pages dealing with any topics on or related to Tardigrada. Links to tardigrade collections have been moved to the Tardigrada Register. If you know any website that you think should be included in our list, please send us an e-mail with the information about it. Please also let us know if any of the links are not working properly. The links are listed in alphabetical order, except for the four most popular sites, which are displayed in the first four rows. A list of all described Tardigrada species prepared and updated regularly by Peter Degma, Roberto Bertolani & Roberto Guidetti. Tardigrade nucleotide sequences in GenBank. Assembled genome of Hypsibius dujardini (Doyère, 1840). A list of European tardigrades and their distribution. (c) to develop mathematical methods to understand and quantify mechanisms, dynamics and driving forces of anhydrobiosis in order to predict changes and to provide a scientific baseline for further investigation and development of products required to stabilize cells. 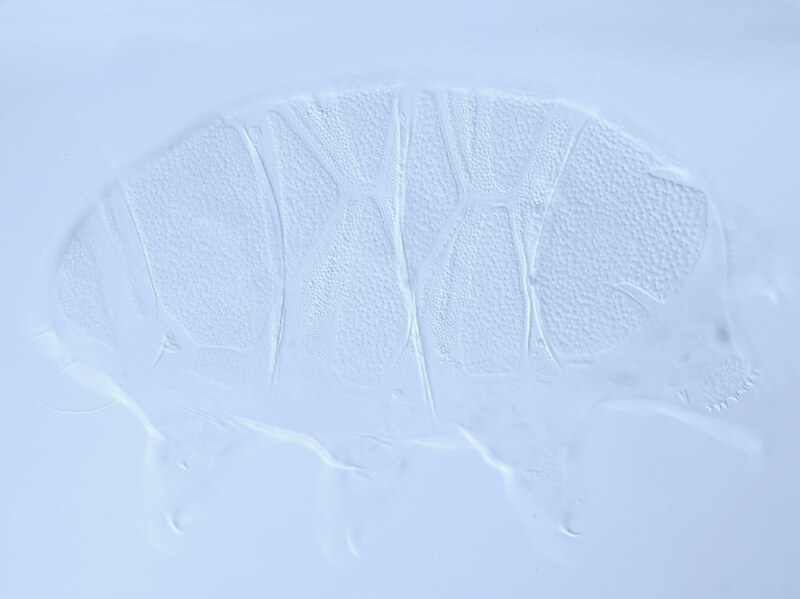 People at the University of North carolina (USA) who are are developing a tardigrade species as a new model system for studying how the evolution of developmental mechanisms can alter animal morphology. A digital image depository funded by the US NSF. Contains numerous images of American tardigrade specimens. A web-based picture key to most common tardigrade genera. Good for kids and novice tardigradologists. The website by Karen Lindahl & Susie Balse contains also a few more sections on tardigrades. An interactive map of marine tardigrade species of the world wich was first published in Kaczmarek et al. (2015), but it is updated regularly by Paul Bartels to include all known marine species and all published records for each. There are three views available: row view (like a spreadsheet), card view, and map view. Subsets of the data can be displayed using the filter function, where species occurrences can be filtered by any variable in the dataset (country, ocean, species, etc.). Note that the map can only display one record when multiple records occur at the same latitute/longitude. To see all records, use the filter tool in row or card view. Each occurrence in the map is clickable and this results in a popup window showing an image of the species and select information about habitat, substrate, etc. A collection of interesting photos and short movies with live tardies. German version of the web also available. A page maintained by Nigel Marley. You can post there any news and requests concerning Tardigrada. Basic info on tardigrades, including collection and preservation methods. A wiki platform for all public-domain papers on Tardigrada created by Gary Grothman. A web-based comprehensive tool, especially designed for Tardigrade genome and proteome analysis. The Integrated Taxonomic Information System (ITIS) was established in the mid-1990's as a cooperative project among several federal agencies to improve and expand upon taxonomic data (known as the NODC Taxonomic Code) maintained by the National Oceanographic Data Center (NODC), National Oceanic and Atmospheric Administration (NOAA). The ITIS mission is to create a scientifically credible database of taxonomic information, placing primary focus on taxa of interest to North America, with world treatments included, as available. A very large database of tardigrade literature back to the XVIII century. Website by William R. Miller. A nice tardigrade song by Cosmo Sheldrake. Tardigrades In Space or "TARDIS" is the first research project to evaluate the ability of tardigrades to survive under open space conditions. TARDIS is one of the projects within the Biopan-6 research platform provided by European Space Agency (ESA), and will be sent into space with the russian FOTON-M3 mission. Website by Ingemar K. Jonsson. Terje Meiers Tardigrade World Nearly 2000 tardigrade literature references. If you follow the link you'll find lyrics and the .mp3 file with the Water Bear song by Mal Webb. Tardigrades in Wikipedia, in over 30 languages.